My cheekbones have gone missing. I have been looking for them in the mirror–during day time under natural sun light; indoor under soft tungsten light; in the office with bright fluorescent light–but they are nowhere to be found. They have indeed gone missing. What I see in the mirror–and most evidently from my travel pictures–are fats, or fat cells, as my gym instructor onNorwegian Cruise Line would refer to. Those are the sad consequences of what would have been a perfect cruise vacation. When I mentioned I packed on pounds in my previous post about binge eating during my trip, I wasn’t half joking. I have indeed put on weight. I have become “bulat” in Malaysian language, meaning r-O-O-O-O-O-u-n-d.
As a remedy, I have to start starving myself eating healthy to shed those unwanted cells; I resort to vegetables, fat cells’ worst enemy. Eating healthy doesn’t mean that one has to swallow tasteless and unappetizing food. I started off my healthy eating diet today with a bowl of this pleasing, fresh, and delicious spinach and tofu salad with sesame miso dressing–a wonderful salad served at my favorite Japanese joint. I felt great after eating this spinach and tofu salad. Listen fat cells, I am fighting back, and now get off my cheekbones please!!! 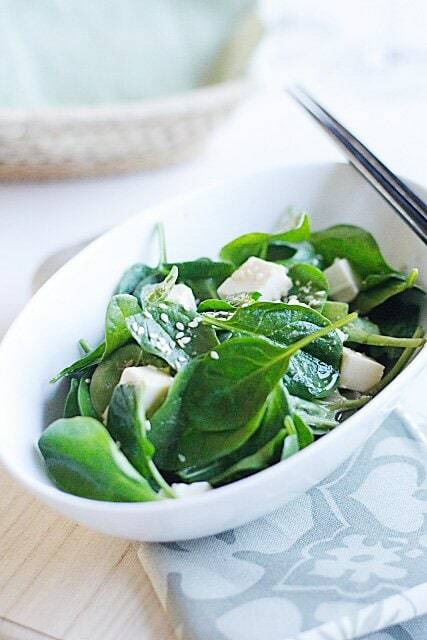 Start your healthy eating diet today with a bowl of this pleasing, fresh, and delicious spinach and tofu salad with sesame miso dressing–a wonderful salad served at my favorite Japanese joint. 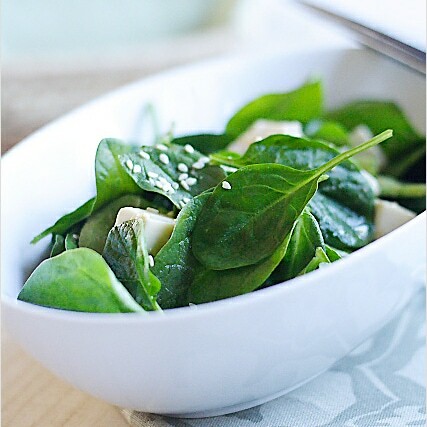 Wash the baby spinach and drain excess water. 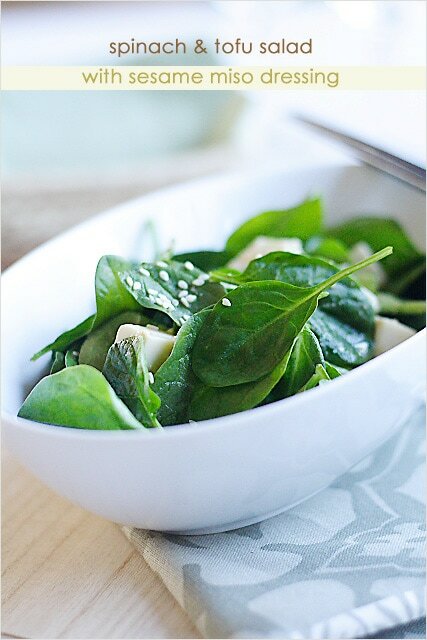 In a salad bowl, toss the baby spinach with tofu and sesame miso dressing. Dish out and serve cold. i’m going to try this one. Thnx! I have been invaded as well :( Can I share the salad with you ? i am from Malaysia,may i know what is ponzu sauce? is it available in Malaysia? thanks. hahah wish u the best of luck in fightin the fats! Anonymous – You should be able to find Ponzu sauce in food stores…maybe specialty food stores. If not, just add lime juice to soy sauce and you get ponzu sauce basically. Just add the lime to taste. Yum! A most delicious way to combat those fat cells I’m sure! A refined and delicate salad! I do a similar one with thte tofu marinated in miso and then pan seared, and with a sesame soy dressing. The first two paragraphs made me laugh so hard :D Hope you get your cheekbones back soon! well surely i can look forward to low fat recipes from you this week! :-) hehe..
Bee, we have met you and we can safely say that you are not in any trouble with invading fat cells! Still, I applaud your efforts to eat healthier. We could all use a little more green! A lovely salad, this is. I think I’d like to try it with seared tofu as well. The salad looks good and sounds simple and tasty. I love salad. Yours is pretty simple to make and sounds delicious. I would give it a try. My tips to dieters: Vegetables are a big part of the solution but do not forget to consume more fruits too. Finally Bee, your blog is amazing too. Thank you for stopping by mine. I will definitely make a habit to come back to read yours. I love this post ;-p, something that i definately can relate too ALL the time. Great for the upcoming skin baring season :) I have been a bit more careful about what I eat. NO need extra padding anymore now that winter is over! Great picture as always, Bee. I know exactly how you feel, I too am fighting the fat cells at the moment. Too much blogging made me fat!! I’ve lost my cheekbones a long time ago. Btw, nice capture of such a plain dish. hi rasa! awww hahaha your cheeckbones will emerge again! i have the same problem since christmas :) this salad looks delicious, i love tofu so much but forget to cook with it often. welcome back — your pictures are beautiful ! Maybe i’m spending too much time in the kitchen. I think i should follow your example! You’re still quite pretty whatever the state of your cheekbones, Bee :) I should start eating lighter fare as well! America was way too generous on my waistline! Nice salad. I like miso seasame dressing. Hey, your recipe came at the right time! spinach n tofu are my favourite! Your pics are always so nice. Anyway I am trying to go on a low carb diet..but the problem is I live in Penang. Arrghhh need low carb hawker food diet ! Why would you think that the pictures are “best viewed with Internet Explorer”. In fact, they can be viewed with any modern browser — even better ones, e.g. Firefox and Opera. Why do you think you have five pictures, given that they are virtually indistinguishable. 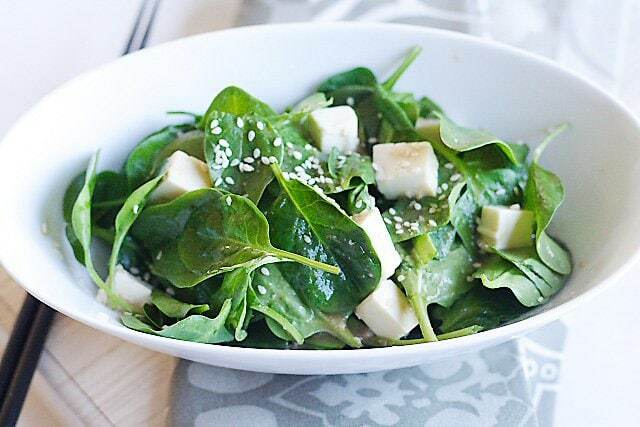 I feel very light just by looking at your spinach and tofu salad with sesame miso dressing. lol. This recipe is a keeper. Still haven’t lost my holiday pounds…..and it’s almost April!! Gonna try this salad, and look into more recipes. Thanks!! with organic ingredients i am sure it will taste even more delicious.